16 January 2019: Deloitte Ireland has announced its current head of its Consulting practice ,Harry Goddard as its next CEO to succeed Brendan Jennings on 1 June next, following his election by the firm’s partners. In addition to leading 750+ professionals in the Irish Consulting practice, Goddard currently heads up Deloitte’s technology practice across the EMEA region, which spans over 25 countries and includes over 8,000 technology consultants. He has over 20 years’ experience in the professional services and consulting industries, and was a key player in the establishment of Deloitte's blockchain lab in Dublin. He works across multiple industries, with a particular focus on the public sector and financial services sectors. His experience is focussed on leading significant transformation programmes for clients. Brendan Jennings was elected CEO in 2011, re-elected in 2015, and served the maximum period as CEO. With Harry Goddard's appointment as CEO, there has been a significant changes in Managing Partners in the past year at the top level of Ireland's Accounting firms, with KPMG appointing Seamus Hand as its new managing partner to commence in May 2019. In December PwC announced the unanimous reappointment of Feargal O’Rourke the Irish firm’s Managing Partner for another four year term, commencing on 1 July, 2019. EY appointed Frank O'Keefe, as its new managing partner in Ireland effective from last July of 2018, replacing Mike McKerr who served for 9 years. 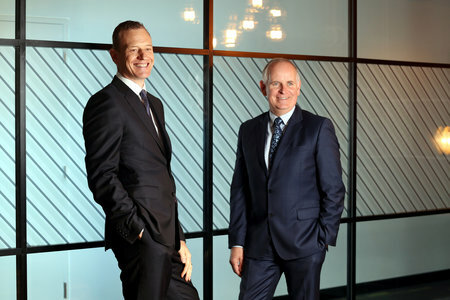 Deloitte Ireland's new CEO Harry Goddard (L) with outgoing CEO Brendan Jennings, who steps down in June after 8 years at the helm. Brendan Jennings, CEO, Deloitte Ireland said: “I am very pleased to announce that Harry has been elected as the next CEO of Deloitte in Ireland. He has considerable experience in guiding his teams and clients through changing and disruptive business and technology environments. This experience will be invaluable to the Deloitte team in Ireland, and for our clients, as they operate in a growing domestic economy and uncertain and increasingly complex international marketplaces. His experience will also help them to keep up with the frenetic pace of technology innovations. Harry Goddard commented: “It is a privilege to succeed Brendan as CEO, whose leadership of our business has seen it grow, expand and innovate. I am excited to lead our business, building on our strong market position, and delivering impactful solutions to our clients that bring their organisations to new levels of development and growth in an ever-changing world. Over the last eight years, Deloitte has grown to nearly 3,000 people who provide audit, tax, consulting, and corporate finance services to public and private clients spanning multiple industries. It has offices in Dublin, Cork, Limerick, Galway and Belfast. It is part of Deloitte North West Europe, the second largest member firm in the Deloitte network, combining operations in Belgium, Ireland, the Netherlands, the Nordics (Denmark, Finland, Iceland, Norway and Sweden), Switzerland and the UK.